I started my quest by asking my ophthalmologist, who enthusiastically provided a dizzying amount of technical information about the variety of eye charts and tests designed for different audiences and eye conditions. Suddenly, a simple question became a series of discoveries. Not only is there no one letterform design or font used for eye charts; the letterform designs are more appropriately called optotypes, of which there are several versions. There is a science to the design of optotypes and their legibility at specific distances. Since I am a graphic designer and not an eye or vision expert, I will forgo the technical explanations and focus on optotypes used on several significant charts to provide a better understanding of this complex and fascinating subject. Heinrich Küchler is one of the first individuals credited with creating an eye chart to test visual acuity. Küchler, a German ophthalmologist, designed a chart in 1836 using figures cut from calendars, books, and newspapers glued in rows of decreasing sizes onto paper. These figures included cannons, guns, birds, farm equipment, camels, and frogs. This system was limited because the figures were not consistent in visual weight or style. 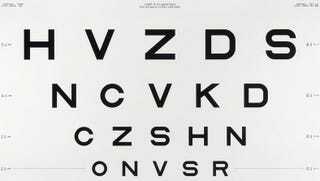 The next significant development in visual acuity chart design was the Snellen Eye Chart, which is recognizable to most Americans from visits to the DMV. In 1959, Dr. Louise Sloan of Johns Hopkins University created ten new optotypes using sans serif letters preferred by Dr. Green. These optotypes included the letters: C, D, H, K, N, O, R, S, V, and Z. Like Snellen letters, Sloan Letters are formed within a square, with the stroke width equal to one-fifth of the letter height and with equal visual weight. The Sloan Chart has consistent spacing between letters and rows that are proportional to letter size. Spacing between letters is equal to letter width, and spacing between rows is equal to the height of the letters in the subsequent, smaller row.11 Notice that, as in the Snellen Chart, all of the characters are consonants with the exception of 0. Also note that the letter selection used on the Snellen Chart is not the same as that in the Sloan Chart. In both cases, the diverse shapes of the optoypes allow test subjects to identify verticals, horizontals and diagonals—an aid to identify or differentiating individual letters. The ten Sloan Letters are considered to be the most effective letter selection for equal legibility. What’s more, they are particularly effective at identifying astigmatism. This post was originally published on the excellent site I Love Typography and is syndicated here with permission. Subscribe to their RSS feed or follow @ilovetypography on Twitter. Lorrie Frear is an Associate Professor in the School of Design/College of Imaging Arts and Sciences at the Rochester Institute of Technology in Rochester, New York, where she teaches graphic design and calligraphy. Go here to see additional footnotes and sources.